The ceremonial heads of the Barony of Ynys Fawr are our Baronesses, Her Serenity Adelindis filia Gotefridi and Her Exuberance Anna Felice Tavestoche. They were invested as our seventh and eighth Baroness on 19 November 2016, and their term will last around three or four years. You can reach them by email on ✉ adelindis@ynysfawr.lochac.sca.org and ✉ anna@ynysfawr.lochac.sca.org. The role of the territorial (landed) Baronage is to represent the Crown and maintain Their presence in Their lands. They are selected by the Crown, after consultation with the populace, to fulfill a ceremonial and leadership role as the liaison between the populace and the Crown. The average term of office for a landed Baronage in Lochac is 3.8 years, in contrast to Officer terms of two years and Crown reigns lasting six months, so the Baronage also provides an element of continuity and institutional memory to the group and the Kingdom. They have the privilege to grant Baronial Awards to those members of the populace they find deserving of recognition, and they welcome recommendations for this. The Roll of Arms is maintained by Dromond Herald and lists all the subjects of the Crown in Ynys Fawr and its Canton, College and Hamlets who have been recognised. Their Excellencies believe strongly that Ynys Fawr can only benefit from closer ties to the rest of the Kingdom, and for this reason they place considerable value on travelling to events in other groups, and sometimes other Kingdoms. Their itinerary lists the events they will be travelling to in the coming months. Members of the Barony are encouraged to follow this example, and so bring the news of the Kingdom’s finest Barony to those beyond the kraken-infested waters who may not know of its glories. Photo by Mistress Ceara Shionnach, from Politarchopolis. 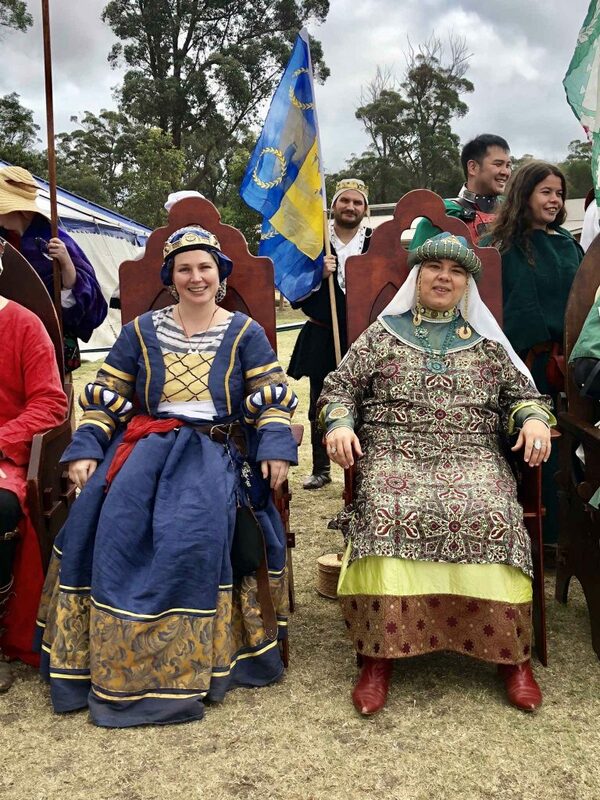 Shows Baroness Anna (left) and Baroness Adelindis (right) with Master David de Darlington (holding Baronial flag) at Rowany Festival, AS LII (2018) at Camp Wombaroo, near Mittagong NSW.